The concept of sustainable development is not only the subject of theoretical consideration but also an important field of actions taken by international institutions. The adoption of the Sustainable Development Goals (SDGs) is one of the results of these activities A special role in this area is attributed to companies which are expected to incorporate the sustainable development principles into long-term business strategy. Social reporting is a tool for support this process. It provides an information on activities and results in social and envi ronmental fields. The aim of the article is to identify trends associated with the publishing information re lated to Sustainable Development Goals. The realization of the article’s purpose was based on descriptive method consists of analysis of the subject-related literature concerning social re porting and sustainable development. In addition, the method of desk research was applied. Results of the research lead to the conclusion that implementation of challenges related to Agenda 2030 had an impact on increase the number of companies published social reports which contain information concerning sustainable development. 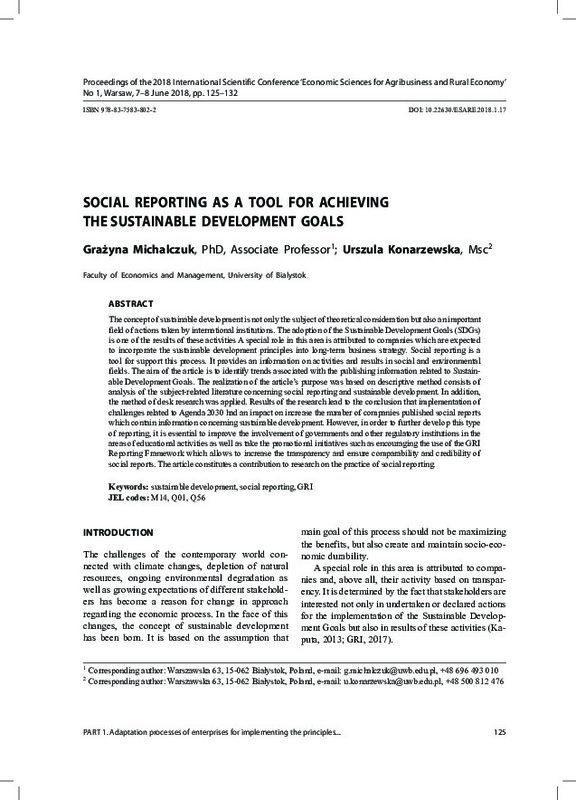 However, in order to further develop this type of reporting, it is essential to improve the involvement of governments and other regulatory institutions in the areas of educational activities as well as take the promotional initiatives such as encouraging the use of the GRI Reporting Framework which allows to increase the transparency and ensure comparability and credibility of social reports. The article constitutes a contribution to research on the practice of social reporting.